For the chicken, melt the butter in a large frying pan over high heat. Season the skin-side of the chicken thigh with half of the salt, garlic, and ginger. Once the butter is hot and melted, add the chicken skin-side down in the pan. Season the upward-facing side with the remaining half of the seasoning. Sear on high for 4 minutes, or until the skin starts to crisp and brown. Flip the chicken over, cover and cook for an additional 5 minutes. Once finished, transfer chicken to a plate, cover with foil, and palace in the oven or microwave (not turned on) to keep warm. For the Paleo teriyaki sauce, to the pan with drippings, add the coconut aminos, vinegar, and fish sauce. Whisk to combine and pull up any brown bits in the pan. Continue to whisk for 15-20 minutes while it simmers. When the sauce is close to being finished, it will start to noticeably thicken. At this point, turn the heat down and continue to whisk together in order to incorporate everything completely. If it starts to thicken too quickly, remove from heat and whisk until combined. For the bok choy, simply place the leaves in a steamer pot over simmering water or covered microwave-safe bowl with 1/2 cup water. Steam or microwave for 5 minutes, or until the leaves are bright green and less turgid. 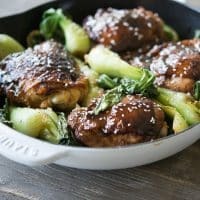 To assemble, toss the chicken and bok choy into the large pan with the teriyaki sauce. Stir to evenly coat and then plate with the sesame seeds.